Discussion in 'Bonus Spins - Extra Spins - No Deposit Bonuses' started by Marina, Jun 22, 2016. The new Video Slot Theme Park: Tickets of Fortune from NetEnt will launch today, 22nd June 2016! Players always looking forward to the release dates of new NetEnt Slots; many casinos reward their loyal customer with free spins to try their luck on the new game! Some of you may have played the game Theme Park Slot already at Betsafe, it is live there since a few days already. A few online casinos sent their players already yesterdaynice promotions to earn free spins for Theme Park. If you deposited and played at Lucky Dino Casino yesterday, you may receive Theme Park free games today! Guts Casino had a really great promotion running yesterday: Players could reserve Theme Park free spins just for wagering on any slots in Guts Casino. If you participated in this promotion yesterday at Guts, you will get free spins today at 17:00 CET. The more you wagered, the more freespins will you get. And remember: There are NO wagering requirements on free spins from Guts Casino and Lucky Dino! Of course we hope that our favourite online casinos will reward us all with no deposit freespins today to play Theme Park. We will post all freespins we receive here in this thread! I just found 5 free spins for Theme Park in my treasure chest at CasinoHeroes ! should have free spins now in Theme Park Slot. Cherry Casino players; check your accounts! Many have now free spins in the new NetEnt game Theme Park: Tickets of Fortune! Found 10 Free rounds on the Theme Park Slot at Redbet Casino. Just got an email from Rizk Casino, they added a few free spins for Theme Park in my Rewards section! I also got a double speed chip (fills up the rizk power bar 2 times so fast) This Double speed chip is also in my rewards! Login to your Rizk account and check in your Rewards, hope many got some free spins for the new slot! MyBet Games added 5 free spins in Theme Park for active players! 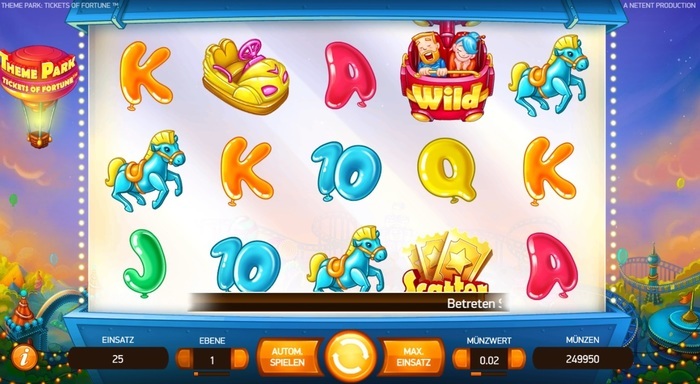 Karamba Casino and Hopa.com added free spins in the new NetEnt Game for some active players. Check in your ComeOn Casino for free spins in Theme Park Slot! Maybe, active players will find also a few free spins in Mobilbet. Check in your Yako Casino in the new slot Theme Park, some players received 10 free spins! I got an Email from Betsson Casino today! There are 20 no deposit free spins in my account for the new Theme Park Video Slot and I can claim 100% deposit match bonus! Check your Betsson accounts, good luck! Super Lenny Casino sent me an email today, that I have 10 no deposit free spins in Theme Park! Check your accounts, good luck! Videoslots Casino has a code for their active players for 10 Free Spins in Theme Park: Tickets of Fortune! Valid for the first 3500 active, eligible players! It is not new having casino heroes gives 50 free spins on new netent game themes park ... Cool! Yeah, if you deposit as far I know, here we mostly post only free spins and free bonuses which do not require a deposit. Although, offers are mostly for active players only, means they must have deposited at the casino already in the past. I have an Email from Trada Casino that I may claim no deposit free spins for the NetEnt Slot Theme Park. I just need to use Code THEME10 for desktop, or, THEME10M for mobile in my Trada Casino account section. If you are an active player, you maybe can claim these free spins too, good luck!